Explanation: What telling impurities taint the ice plumes of Enceladus? To help answer this question, the robotic Cassini spacecraft dove last week to within 30 kilometers of Saturn's ice-plume emitting moon. At this closest-ever approach, Cassini attempted to sniff and obtain chemical data on particles ejected from Enceladus' regular surface, while at other times Cassini flew right through -- and sampled -- ice geysers directly. Searches in the data for impurity clues in the water-ice dominated plumes and surface ejecta are progressing. Although the main purpose of this flyby was particle analysis, several interesting images are emerging. Visible in the above image, for example, is an unusual gray sheen running vertically up the image center that might be water vapor escaping from surface canyons. Other notable features visible above include vast plains of craterless icy grooves, the day-night terminator across the image left, and an area near the top comparatively rich in craters. 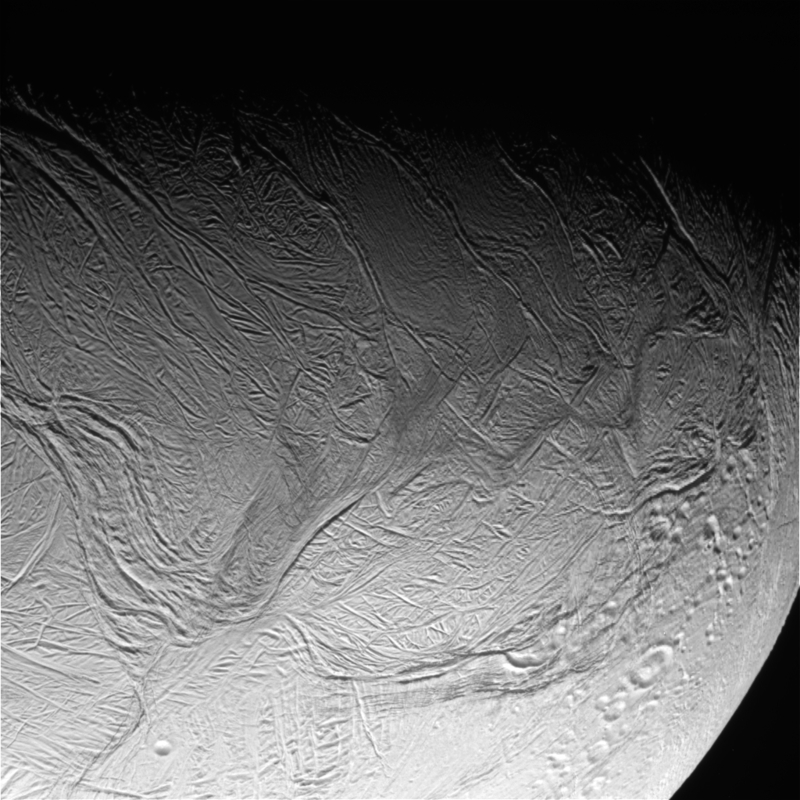 Cassini is scheduled to buzz by <a href="http://en.wikipedia.org/wiki/Enceladus_(moon)">Enceladus in an imaging run near the end of this month.